I’m absurdly late to this, I know (blame my holiday), but here’s an introductory post about the screen version of Julius Caesar that we are immensely proud of co-producing with the Donmar. Phyllida Lloyd has directed a screen version of her stage production which is one part of a Shakespeare trilogy with an all-female cast led by Harriet Walter (above). The three plays were presented by the Donmar in a specially built theatre at King’s X in the months running up to Christmas late year, and we have also filmed Henry IV and The Tempest. Details of these releases are to come, but Julius Caesar had its premiere last month at the Edinburgh International Film Festival and then just under a fortnight ago it began a limited theatrical release in UK cinemas (with a handful of dates still to come). The film will go out into the world in other ways too, and plans for those are just now being finalised. Extracts from reactions are below, but first here is the trailer for the film. There is so much to say about this film version which was recorded live during two performances with a distinctive configuration of cameras directed by Rhodri Huw. Phyllida oversaw elements of additional filming and then took the material into an image and audio post-production process to transform the initial captures into a dynamic and cinematic version for the screen. So the result is quite different from a live or “as live” screen presentation from a theatre. I’ll return to reflecting on the process when we know more about the next stage of the release of this and the other two films. To date, Julius Caesar has attracted two detailed trade reviews and a wonderfully rigorous response from Peter Kirwan for his invaluable Bardathon website. It’s exhilarating to be shown a Shakespeare which is tangibly alive on screen in an unexpected, progressive way, and a relief to see the greats soldier on to a new generation with such vitality as delivered by Lloyd, Walter and this cast and crew. 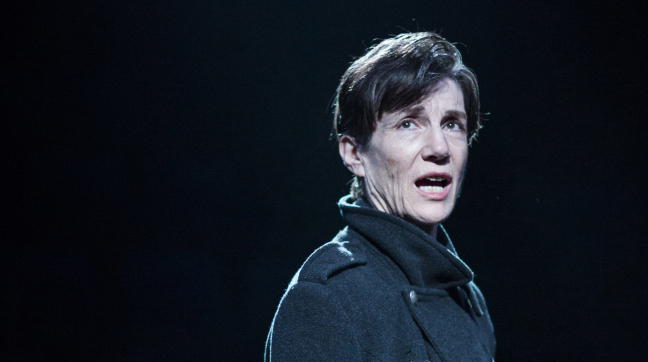 The Donmar Warehouse’s film of their all-female Julius Caesar is a labour of love. Directed by Phyllida Lloyd, it’s definitely a filmed performance rather than a feature film and, as such, has to make a monumental effort to overcome the challenges of capturing live performance – which it does. Lloyd, ever inventive, goes a long way towards solving these problems with a guerrilla filming style, attaching Go-Pros to members of the cast and arming them with iPhones. There’s a drone shot too, a stern birds-eye view that surveils the in-the-square Kings Cross Theatre where the performances were filmed. Alongside cameras working more traditional angles, the whole is edited into a fluent articulation of the live production, absolutely the chronicling of the project that it deserves. There’s a kind of reflexive curiosity to witnessing the onscreen audience react, but the filming style privileges the cinematic audience: we get to go where the theatre audience, fixed to their seats, never do. The central pairing of Walter as Brutus and Martina Laird as Cassius is brilliantly cast, with Laird a threatening and insecure presence throughout. Cassius is passionate, disaffected, sullen; when Caesar refers to her ‘lean look’, she does so publicly, calling out the simmering rage of the character before forcing a doughnut into her mouth with some violence. The scene in which Brutus and Cassius discuss Portia’s death is brilliant, the contrast between Walter’s stoicism and Laird’s rage creating a genuinely tense atmosphere; Cassius’s subsequent expression at Brutus’s performance of nonchalance at the formal report is devastating. My real complaint about these scenes is the over-reliance on close-up. The film’s use of go-pros and hand-held cameras gives a gritty, intimate feel to the scenes, but as well as not serving Walter’s performance well (it’s just too close), the cross-cutting loses the space between the two where the energy crackles. This is, I think, a wider issue with filming stage performance – too often the tendency is to save wide shots for large group scenes and go down to close-up for duologues, when a two-person scene still needs its contextualisation within the space. Oh please please please tell me that these will become available on dvd or for streaming, and I will throw my money at you! I just got back from a trip to New York only to find an announcement from St Anne’s Warehouse that they’ll be screening these from May 31-June 3, aaarrrgh! Mariano, we are in discussions with the Donmar about the possible release on DVD of the Shakespeare Trilogy, which includes Julius Caesar. I will let you know as soon as we have anything more definitive. Thanks for your enquiry. John, this seems an intriguing production. I hope to view ASAP! Thank you. We are in discussions with the Donmar about the possible release on DVD of the Shakespeare Trilogy. We’ll keep you updated.